Vintage Morris Oxford and Cowley "Bullnose" motor-cars of the 1920s. Homepage. This page: A guide designed for owners of Morris Cowleys, Oxfords and Morris Commercial vehicles. Dallas & Co., Morris Cars sales agent. The "Bullnose" Morris Oxfords and Cowleys of the early/mid 1920s were two of the most popular mid-sized motor-cars available to motorists in Britain at the time. The unofficial "Bullnose" nickname came along thanks to the curved radiator fitted to these cars. Two models were produced - the Cowley, and the more upmarket Oxford, although both at first glance look virtually identical. In 1926 both cars received a mild make-over, and the distinctive radiator was replaced by a more upright, squared-off version. This pocket-sized Motorists' Road Guide features Bullnose Morris cars and commercials throughout, dating it therefore to no later than 1926. The cover features a 14-28hp Morris Oxford four-seater tourer. Costing 3d, this guide was issued by Dallas & Co. (proprietor Walter Dallas), a Morris sales and service agency in Scotland. They operated from a garage at 77 Sandygate, in Ayr, and also 91 Portland Street in Kilmarnock (the latter now home to a bar it seems). The rear cover also features an advertisement for Dallas & Co., a company that dealt with "Nothing But Morris" and where potential customers were encouraged to "Buy British and be proud of it". 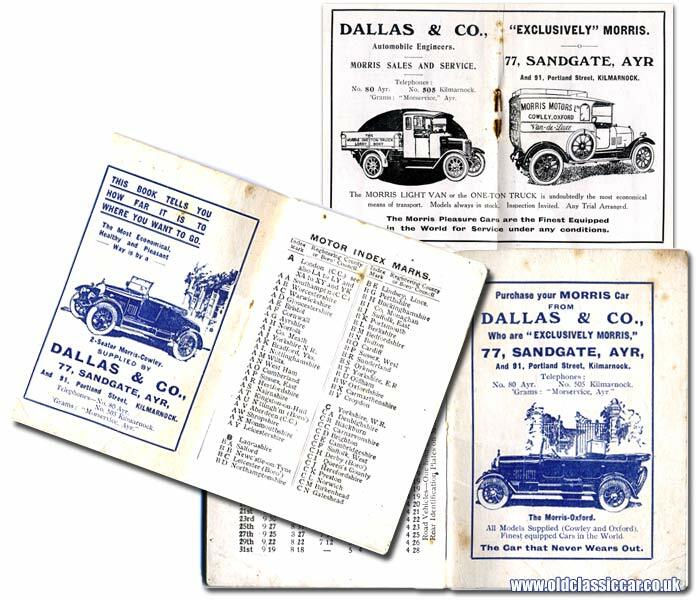 Was this a guide produced solely by Dallas & Co., or a Morris factory item tailored to individual sales agencies and towns, in this case for Dallas & Co. in Ayr? This guide contained a useful amount of information for the Ayr-based motorist. The content begins with a full list of vehicle registration letter codes, and the areas to which they relate. International country codes, including those of "British Possession" (eg British India, Gibraltar, Guernsey and Malta) are also given. This is then followed by a Milestone Speed Table. If the driver timed him- or herself over one mile, between milestones, this table could be used to calculate their average speed over that distance. If, for example, the one-mile dash took 10 minutes flat, then you'd covered the distance in a snail-like 6 mph. Speed fiends though, who covered the measured mile in a dazzling 36 seconds, could bask in the glory of knowing that they'd achieved a 100mph average - not something that would have concerned most motorists at that time, unless their surname was Cobb, or Campbell perhaps. 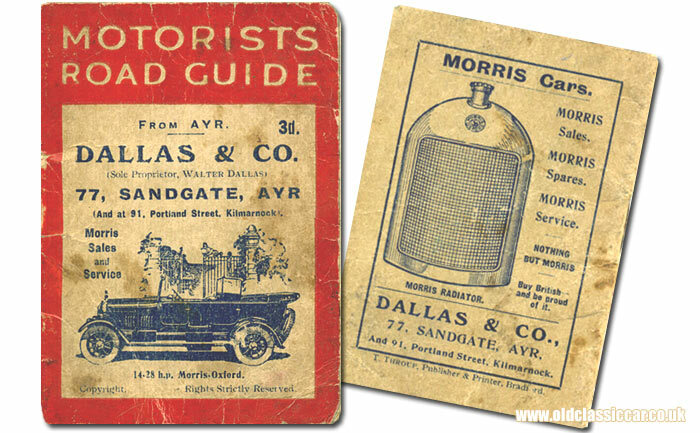 Following a handy reminder regarding service intervals for Morris motor-cars, which included notes on having engine valves re-ground after 5,000 miles, and the cylinders oxygened at the same interval, there followed a comprehensive list of destinations, and the distance of each from Ayr. A further breakdown of the more popular routes also gave an indication of how tough the gradients encountered on the route would be. There then followed a table explaining the cost of purchasing a part-licence, depending on which month of the year you re-taxed your automobile. Two pages describe some of the legal aspects involved with buying, owning and selling a car, in addition to information regarding the licencing of a motorcycle, motor scooter, or cycle fitted with auto-wheel. All very handy stuff. Morris - the most economical means of transport. Interspersed amongst this information are advertisements for Morris cars. Inside the front cover is a drawing of a two-seater Morris Cowley, the driving of which was described as "The Most Economical, Healthy and Pleasant Way". The centre pages make way for illustrations of both the Morris Light Van (the Van de Luxe according to the signwriting on the van's sides), and the Morris One-Ton Truck, both of which were "... undoubtably the most economical means of transport" with inspection welcome, and any trial arranged. In case the reader was in any doubt as to the merits of Morris vehicles, he/she is reminded that "The Morris Pleasure Cars are the Finest Equipped in the World for Service under any conditions". Adverts for the Morris Cowley, the Oxford, and the commercial range. A final advertisement printed inside the rear cover again reminds readers that they could purchase a Morris Oxford or Cowley from Dallas & Co., who were "Exclusively Morris", and therefore selling the "Finest equipped Cars in the World". The illustration shows a four-seat Oxford tourer (The Car that Never Wears Out), complete with Auster screen fitted to prevent rear seat passengers being unduly buffeted at speed. More items relating to the history of motoring may be found in the Motoring Collectables section. Included amongst them is a leaflet from the mid-1920s, encouraging people to enter a raffle where the first prize was a four-seater Morris Oxford tourer.